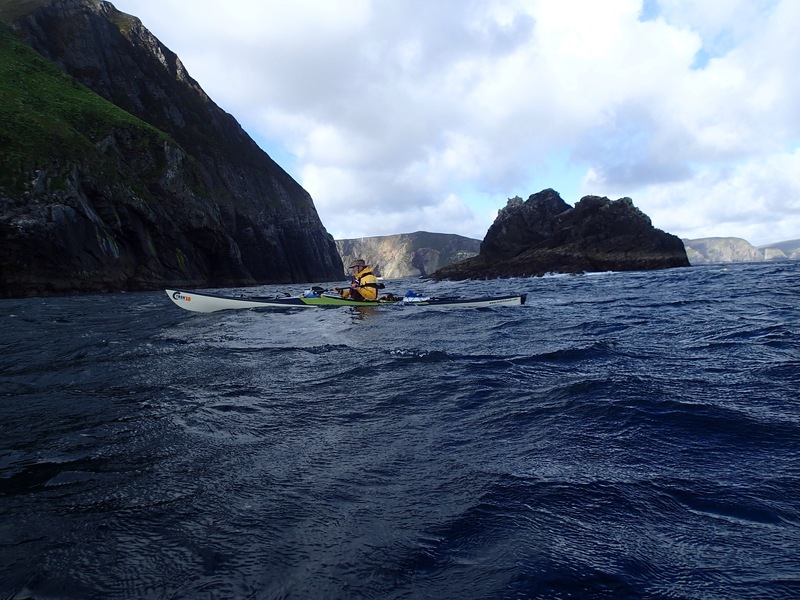 Last night we pulled into Brandon Bay after a stunning 22 miles along the north side of the Dingle Peninsula. 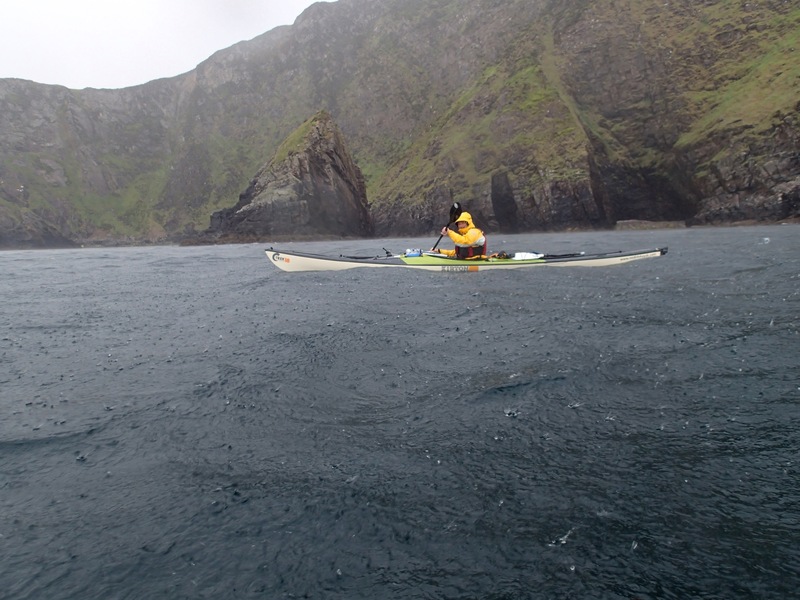 Mountains meet the sea and make for a breathtaking backdrop to our paddle. The size of the cliffs plays with your perspective and only a passing gull against them gives you a hint that what you are looking at is not a couple of hundred metres away but more like a couple of miles. 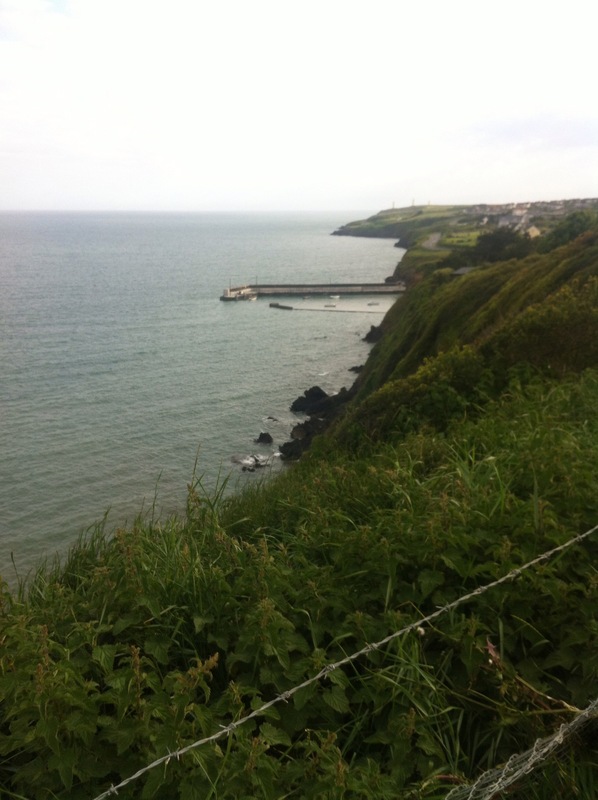 Everything on this side of Ireland’s coast seems immense. The landscape even shapes the local weather. Despite the forecast being for F3/4, the hills and mountains funnel and accelerate the winds, particularly in the afternoons it seems, and we often experience sustained F6 gusts. 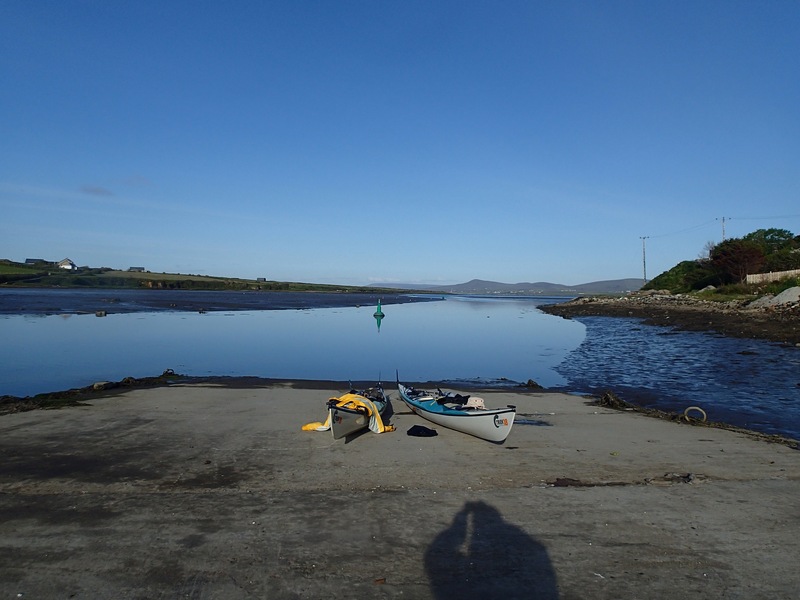 It had not been a long day but it was a good day in that it set us up nicely for our most committed and open crossing yet – across Kerry Head and the mouth of the Shannon up to Loop Head. We tucked the boats away by the side of the harbour wall and walked all of 20 yards to a great pub, ordered a pint and some grub. A little later that evening I popped down to the Harbour to check on the boats only to to see a shivering man getting changed. 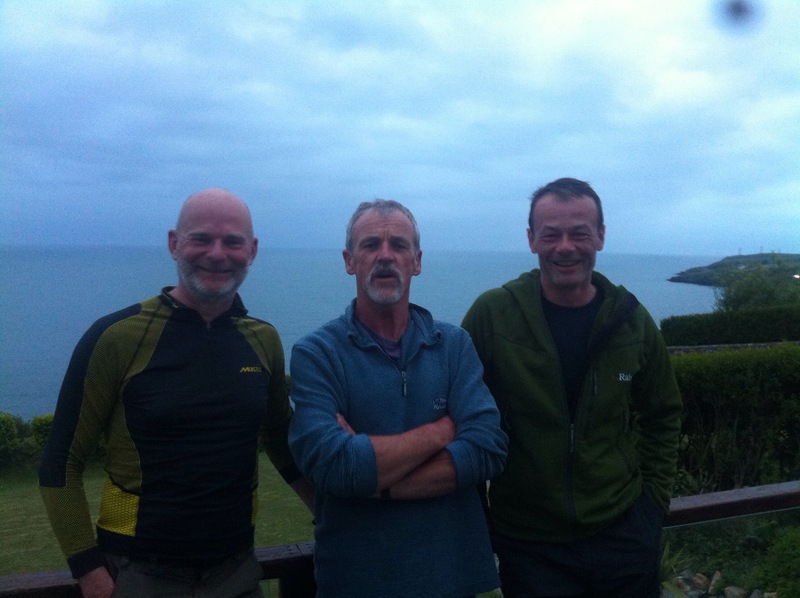 It was Mick O’Meara, who met us in Tramore. He had set off last Thursday and had already caught us. He’s been averaging 45 miles a day! 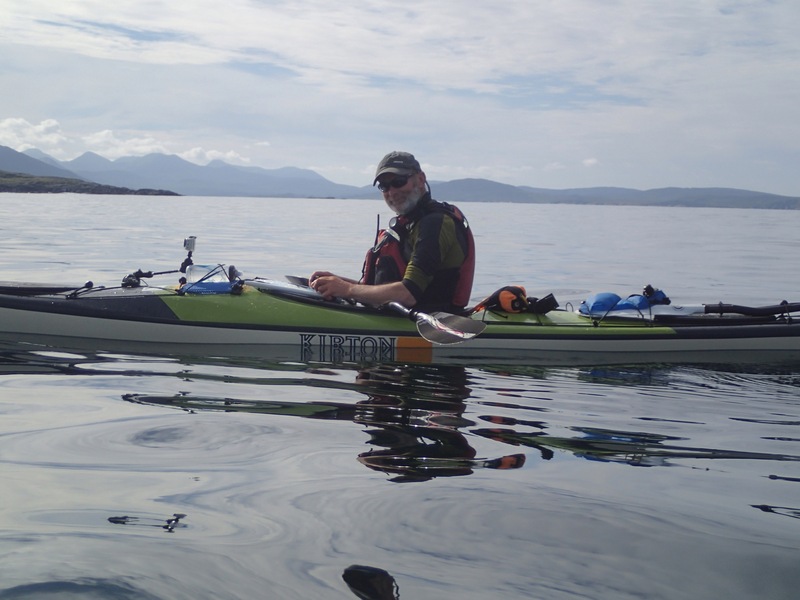 We helped Mick with his kayak and returned to the bar for a beer and a catch up. A couple of beers and a slug of Lagavulin later we climbed into our tents having agreed to do the crossing together the next day. 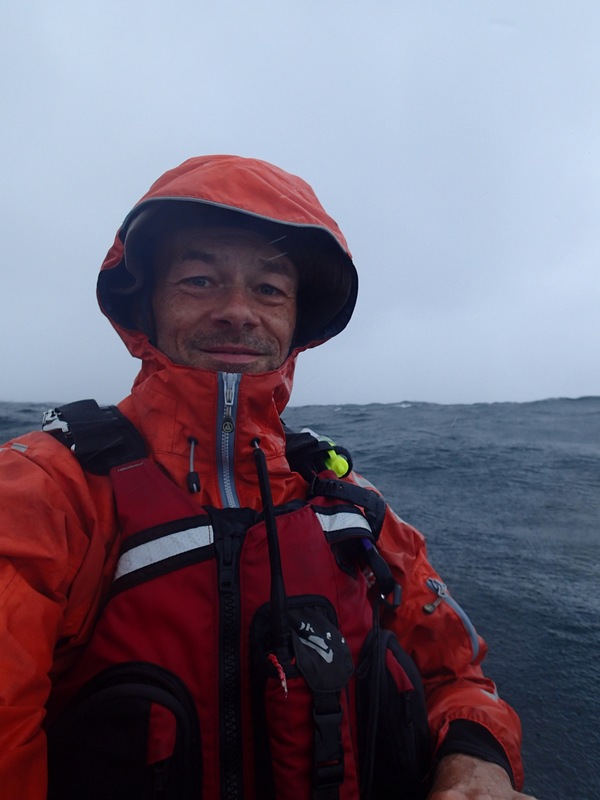 We were up and on the water by 07.45 and heading north east. To our right we could see Kerry Head about 12 miles away. That would be the only land we would see until about half way across the 23 mile open crossing. 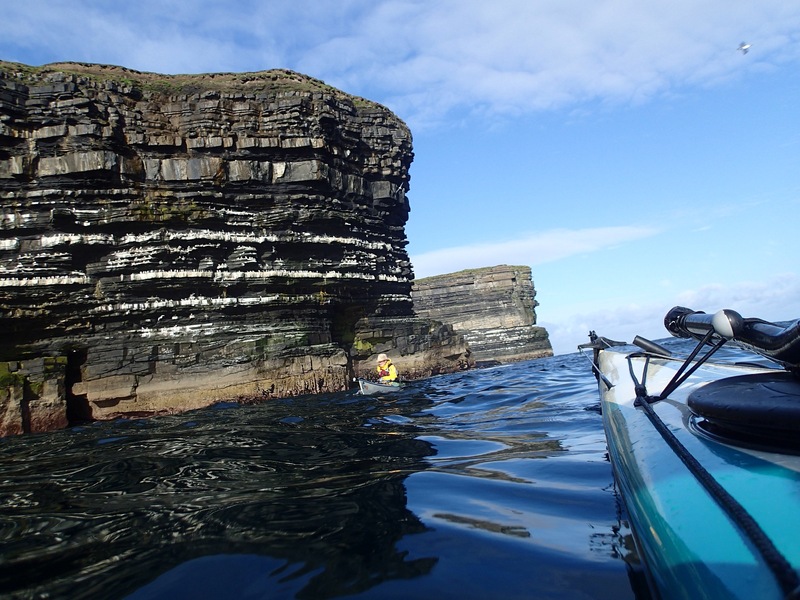 Loop Head is on fairly low lying cliffs and so we had to trust that our bearing (and our ability to stick to it) would deliver us on target. Mick has access to some very detailed localised forecasts which suggested we should expect a south westerly wind all day F4/5. We knew that the wind would be stronger until we escaped the clutches of the mountains around Brandon point. And so we set off with a solid F6 behind us, pushing us along at around 5 or 6 miles and hour. From the off we told Mick that if he fancied pushing on he should, and not let us hold him back. But I think he and us welcomed the company on such a committed crossing. The miles were soon ticking away and as we left the mountains of the Dingle Peninsula behind us, the wind did die down to a F5. 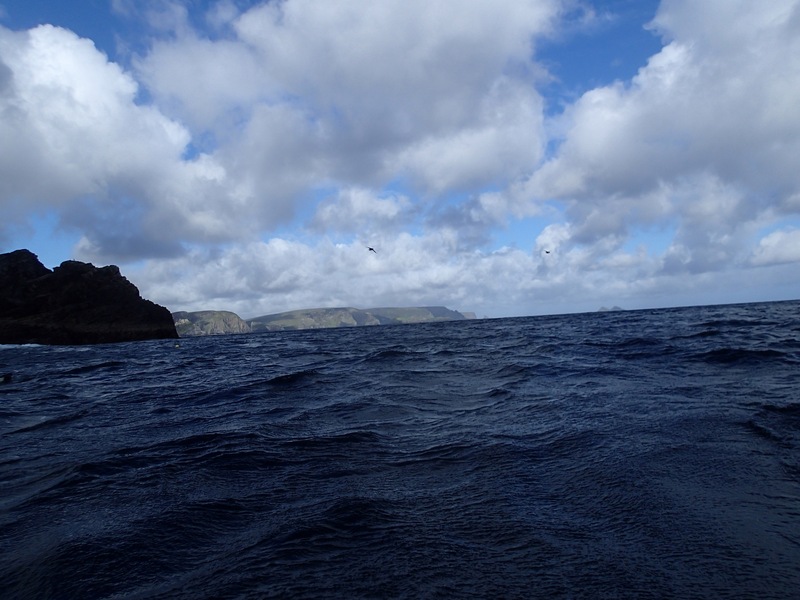 But we were now exposed to Atlantic swell around four metres. 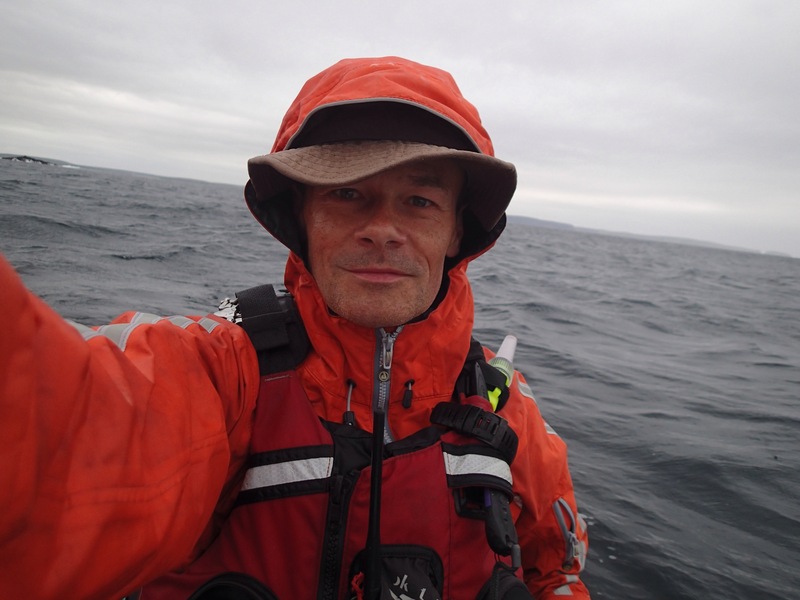 Progress slowed a little to around 4.5 miles an hour which we felt was ok given the confused state of the sea. Geoff and I could tell Mick could easily have squeezed his speed up a few notches. We hoped he wasn’t too frustrated being held back by us. The conditions were testing but comfortable. 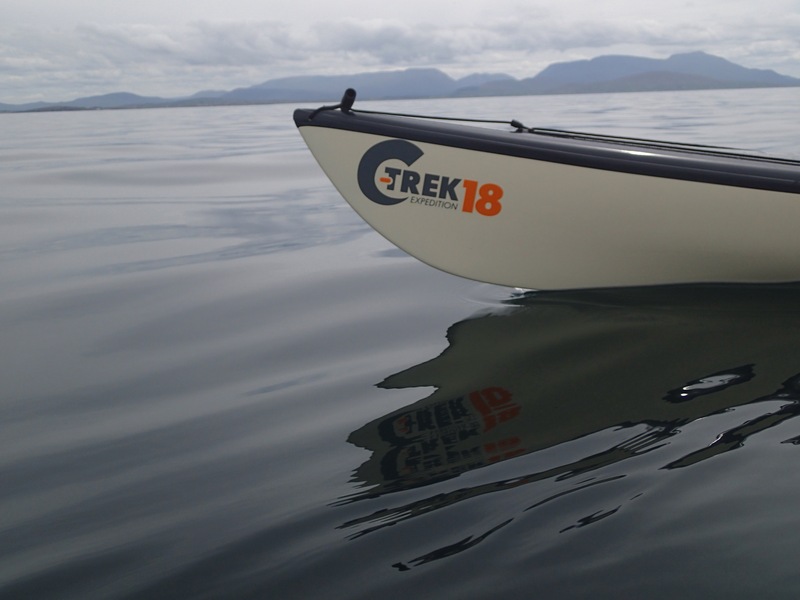 Every so often a swell would crest and break over the boat requiring a brace stroke to keep upright and to keep a straight course. 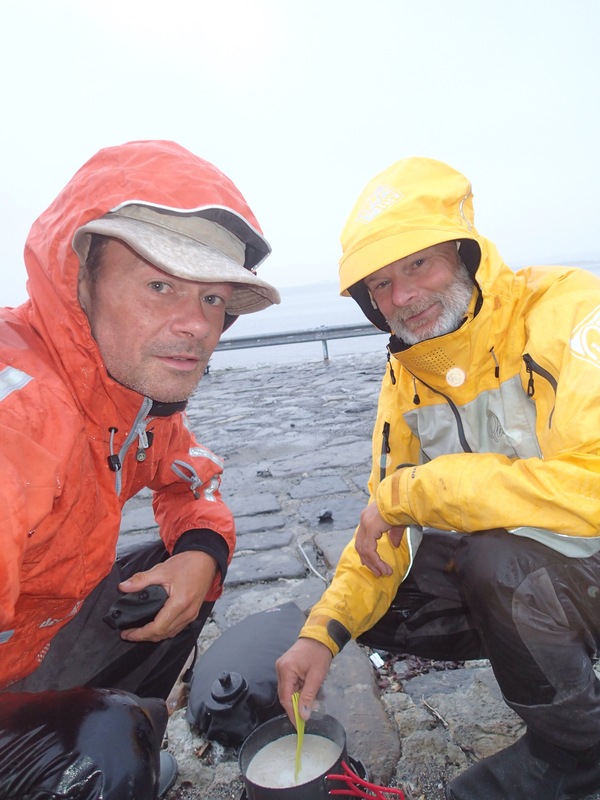 One slightly comical moment was when Mick and I were chatting only to both turn round at the same time to see what must have been a seven metre swell behind us with a rather composed Geoff trying to surf down it. I think it was at that moment we thought that this was going to be a big day. Ten miles in and now and again as we rose up on each swell we could see Loop Head appearing in the low mist. We were on course. Kerry Head now behind us after three hours, we were half way across and just entering the mouth of the Shannon. 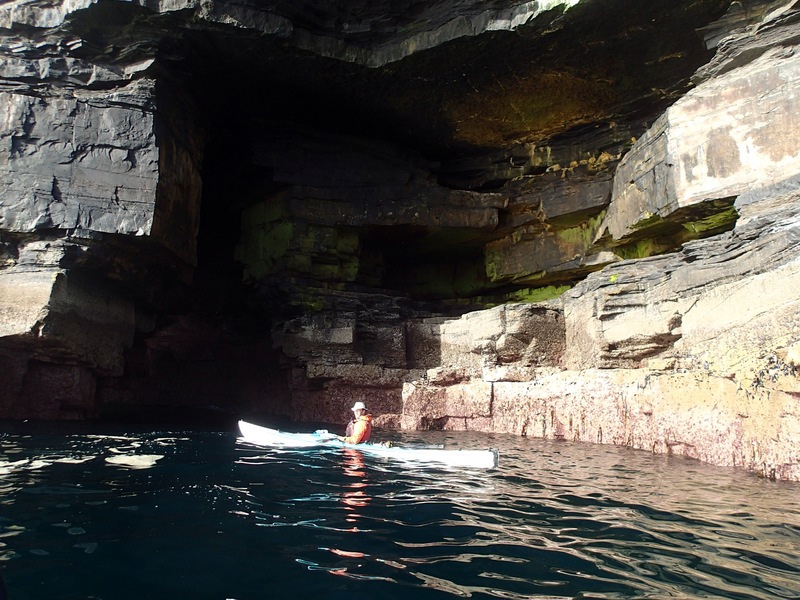 Another hour and a half later and after a precarious pee stop, our minds turned to what kind of sea awaited us around Loop Head. 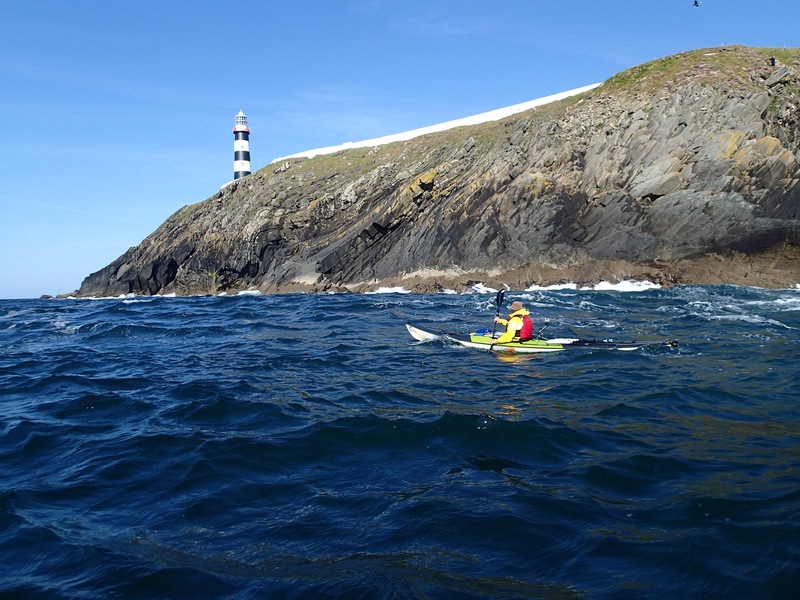 The south west swell would be reflecting back off the cliffs and causing all manner of mayhem – clapotis, pyramid shaped waves that appear without warning and thrust you and the boat in the air with no solid water around to brace your paddle on for support. 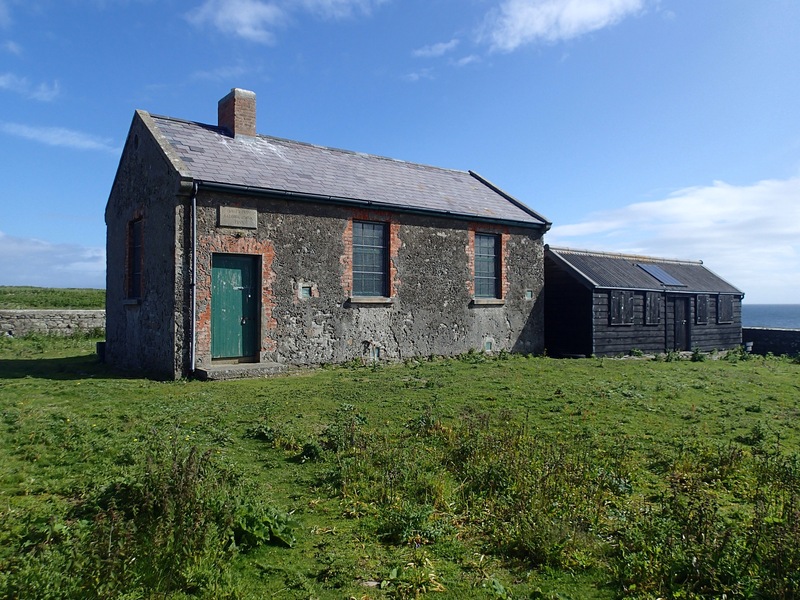 The only sensible option was to give Loop Head a wide berth – a mile or so. 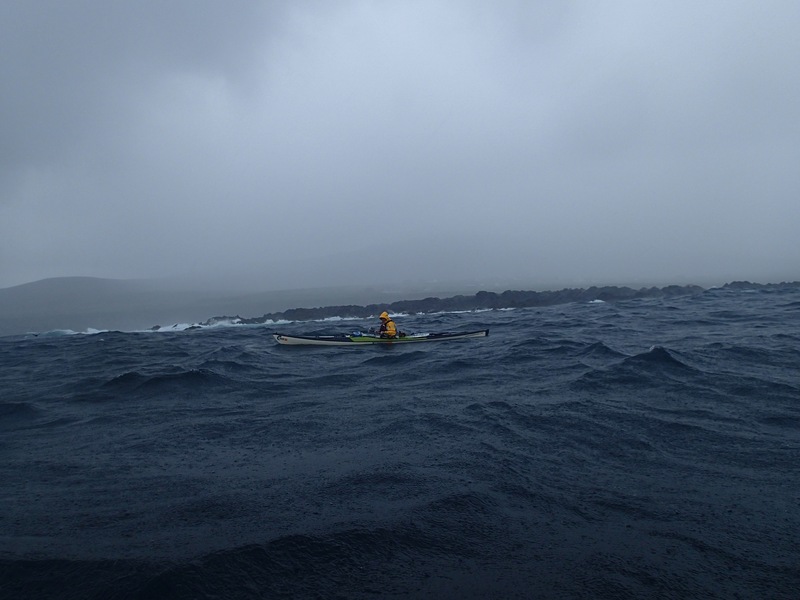 It would be each paddler for himself for the next hour and a half as we made our way past the headland. Swells seemed to be hitting us from all directions now. Time to really concentrate. We could just make out tourists on the cliffs looking out. What must they have made of us three mad kayakers! The clapotis died down and the tension eased. We’d made it without mishap and any time you test yourself in conditions you learn a little more. Geoff and I stopped on the water and had a sandwich. 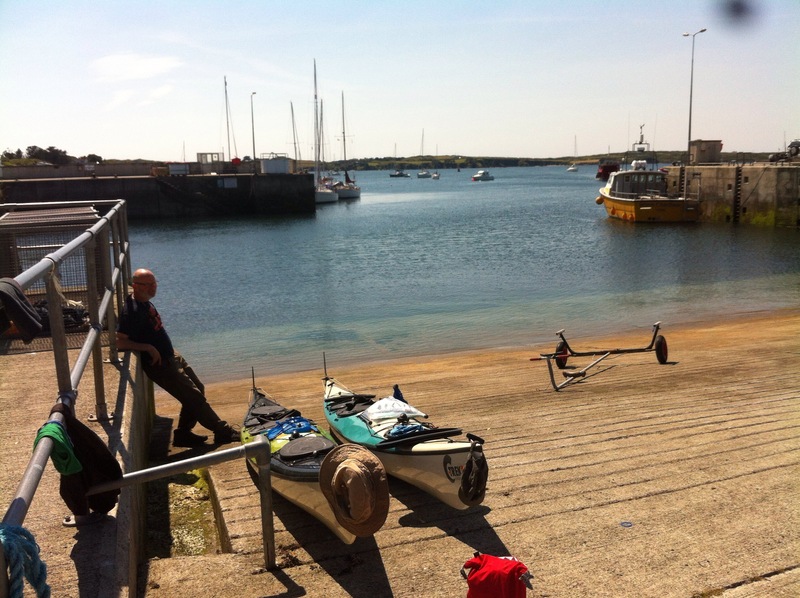 Mick had pushed on and landed in a bay for a stretch and food. We figured he would catch us pretty quick – and he did. 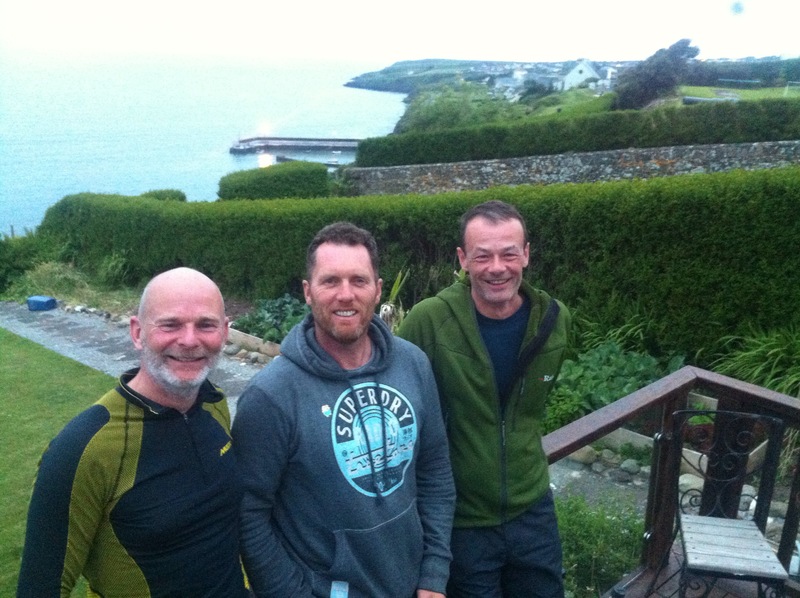 Finally after around 9.5 hours and 39 miles we said goodbye to Mick as he pushed on up the coast and we negotiated the reef in Kilkee bay and sought safe landing. We are now a third of the way round and hope to be on the Aran Islands by Friday. Today however the winds have kept us off the water. 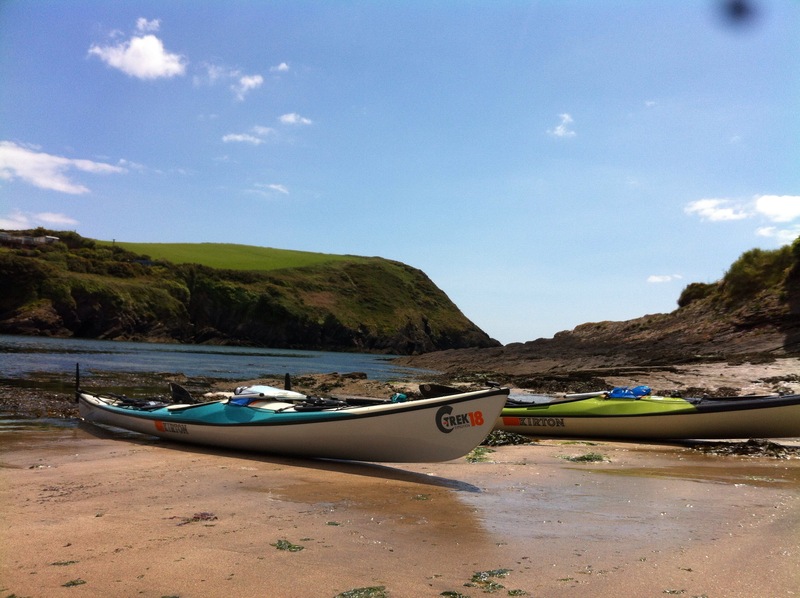 I think we are both relieved to have a day off after paddling ten days in a row. Thank you Cynthia and Liz for your generous donations! Means a lot to us. Sitting in a bar in Baltimore, the last town before we head up the West Coast, just reflecting on what an incredible week we’ve just had. Sorry the blogs have been a bit intermittent but we don’t always seem to have data connections. 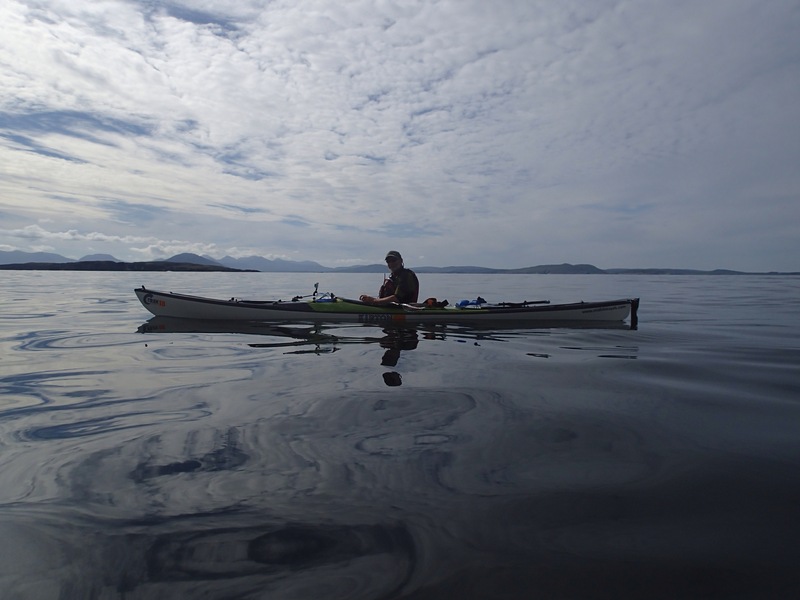 In our first eight days we’ve paddled 160 ish miles, seen some incredible scenery and wildlife and met some friendly and generous people. The coastline has already lived up to its reputation. 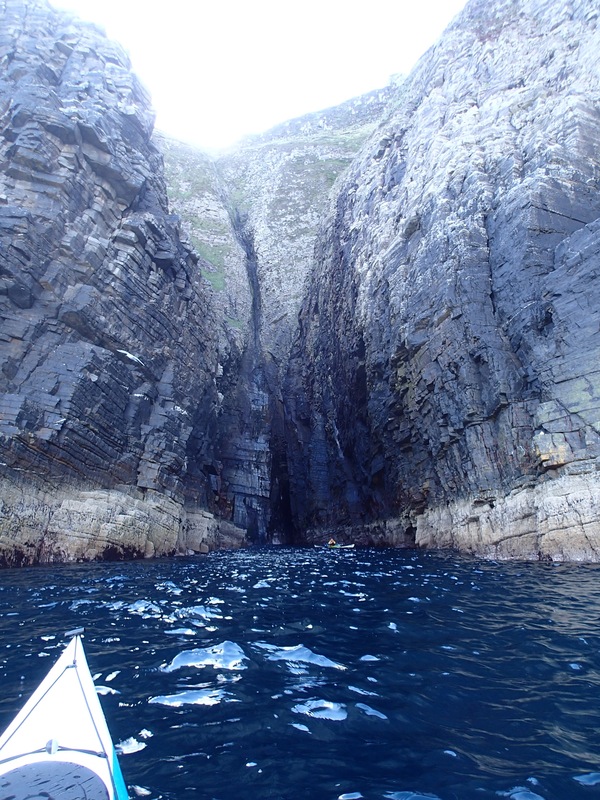 As we’ve paddled west the cliffs have started to grow and look increasingly dramatic. 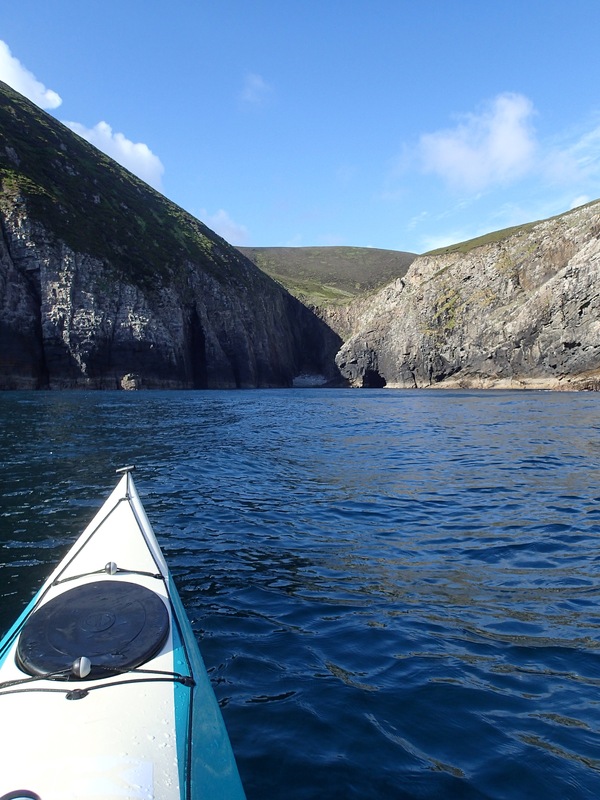 Whilst the majority of paddling has been headland to headland stuff leaving us a few miles offshore, each new bay that reveals itself seems to be even more jaw droppingly beautiful than the last. And that’s not meant to be an insult to the east end of the south coast, it’s all good. 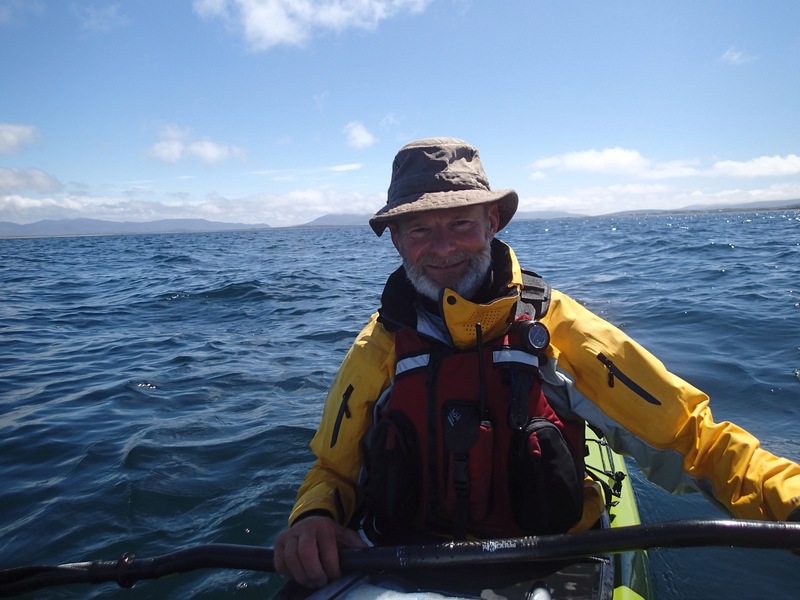 We’ve paddled with flocks of Guillemots and of Shearwaters circling our boats, coming in low to check us out and peeling off at the last minute climbing to circle and come round again. We’ve been given high dive demonstrations by fishing Gannets and entertained by the comedians of the sea bird world, the Razor Bill, which look for all the world like a cross between a penguin and a duck (well to me anyway). They look so clumsy in the air but once in the water look serene. We’ve also seen Chuffs and Puffins and lots of birds we didn’t know the names of. 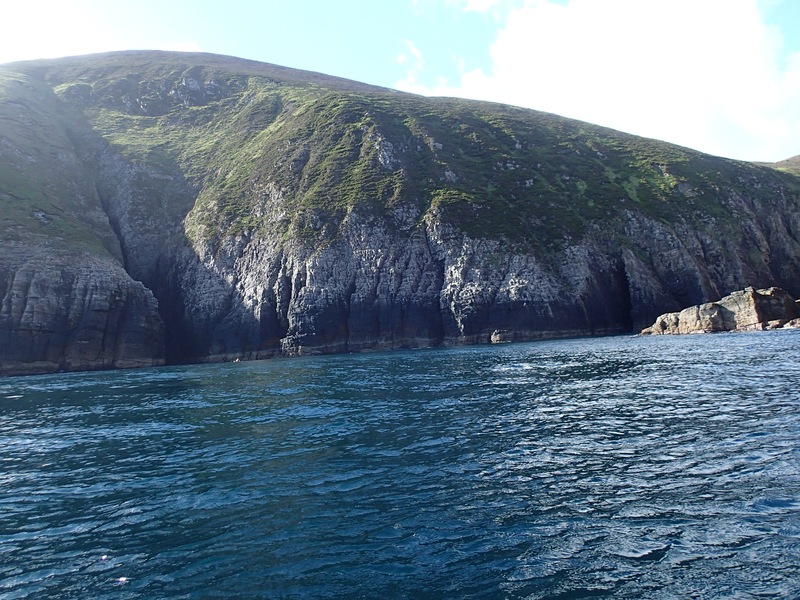 And then yesterday, perhaps the highlight of the wildlife week, we had just launched from a stunning sheltered bay on Galley Head and discovered a basking shark feeding just offshore. 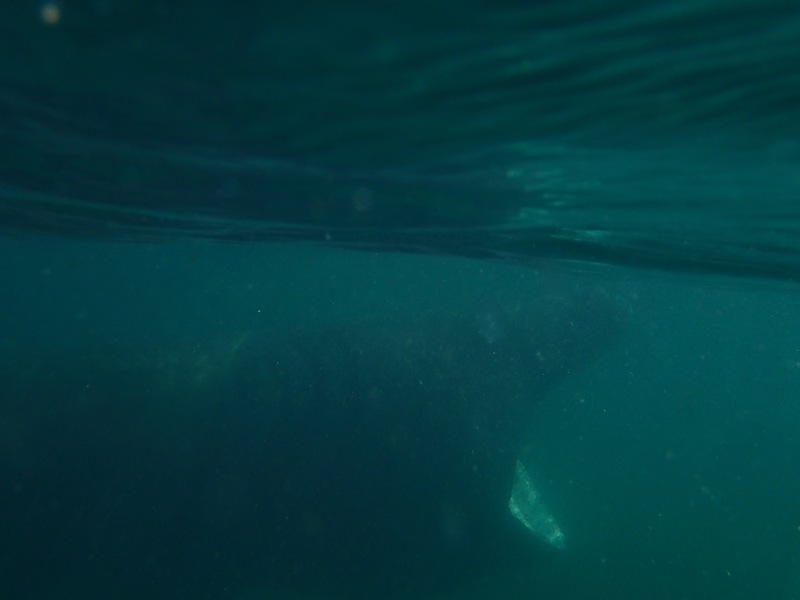 We stayed peacefully alongside it for a few minutes as the 3 to 3.5m beauty filtered the water alongside and under our boats. An amazing experience – the photos don’t do it justice. We’ve met some more great people. 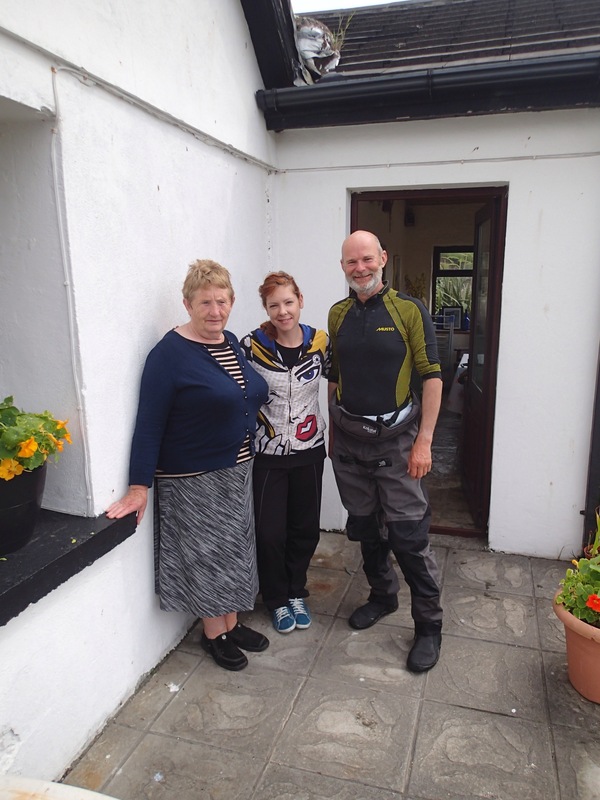 Jon Hynes and his lovely family, put us up in their house in Kinsale, washed our clothes, fed us and took us on a stunning tour of the Old Head of Kinsale (particularly fascinating for me as it is where my family are from originally). 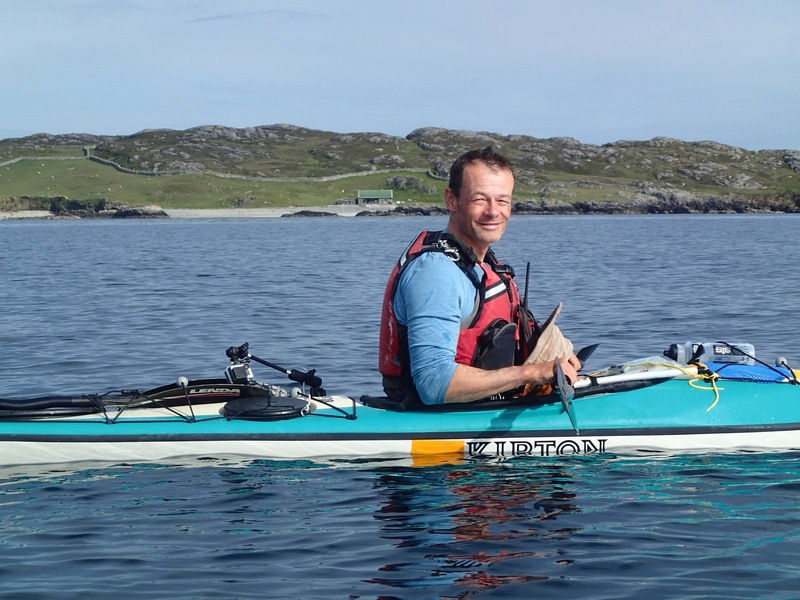 Jon is also a very gifted paddler and outdoor pursuits instructor and guide. He knows his stuff and spent a couple of hours sharing his knowledge of the West Coast with us. 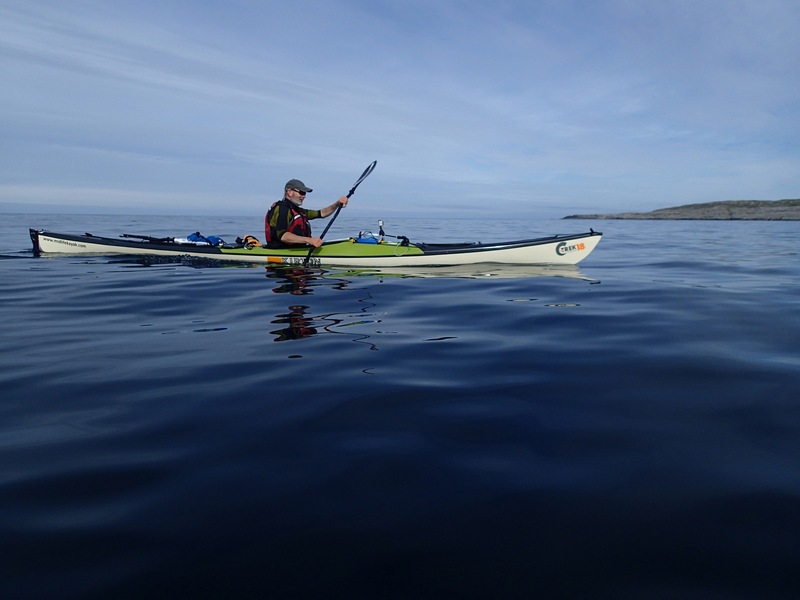 Jon is also paddling around Ireland this summer. Geoff and I are fully expecting him to overtake us pretty soon after he starts! 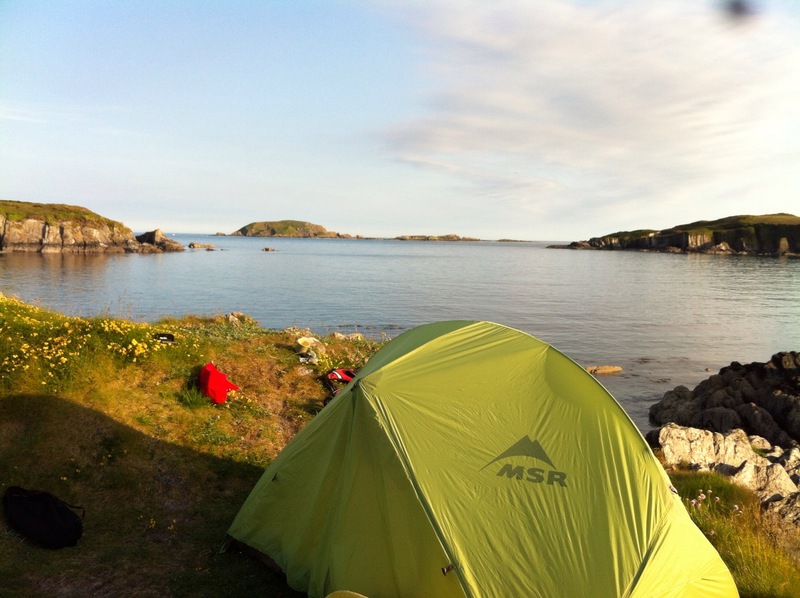 Last night we were camped in a stunning sheltered spot in Glandore Bay. We got chatting to friends Louise and Kat. A little while later, their husbands, Rob and Matt, came down to the beach with BBQ fish, potatoes and some wine. The problem was that Geoff was asleep and knowing how much he values his rest, I decided it was in his best interests that I should eat the fish. We ate the potatoes on our paddle into Baltimore this morning. 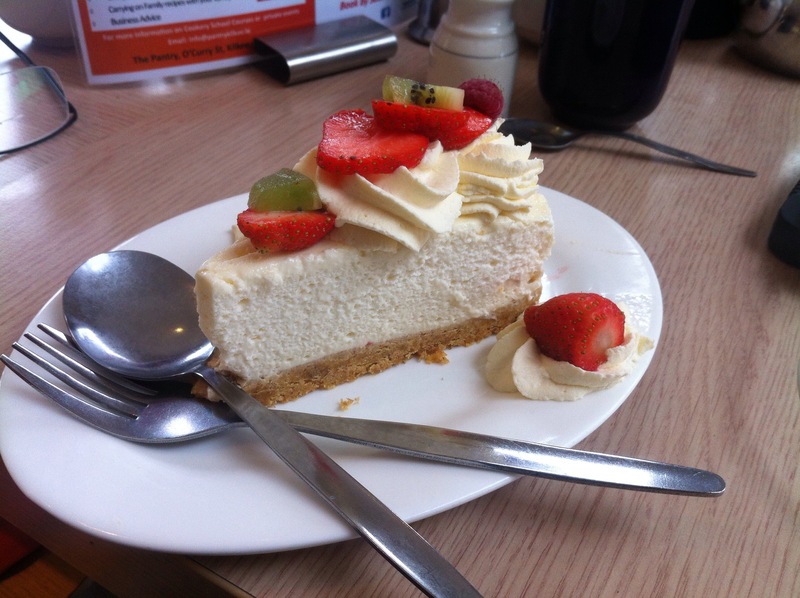 So thanks Jon, Kat, Louise, Matt and Rob! It is meeting people like your goodselves that is making this trip so special. Neptune and the weather gods have been kind to us this week. 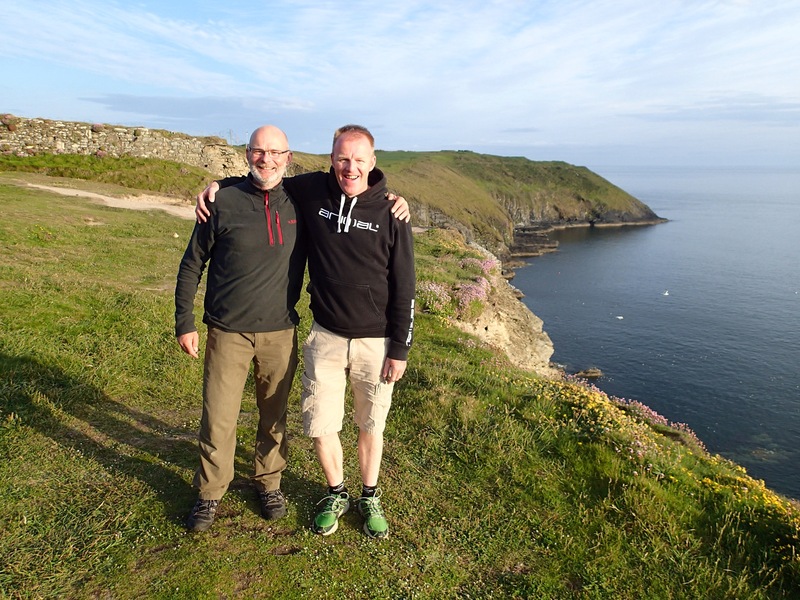 We’re both increasingly apprehensive about facing the West Coast and the Atlantic swell but also excited about the adventures it has in store for us. The week has at times been an emotional roller coaster. The “why?” Question eats away at you when you feel tired and vulnerable but as we build the mileage, that will ease. One thing about these trips that amazes me, is just how many experiences seem to be squeezed into just one day. 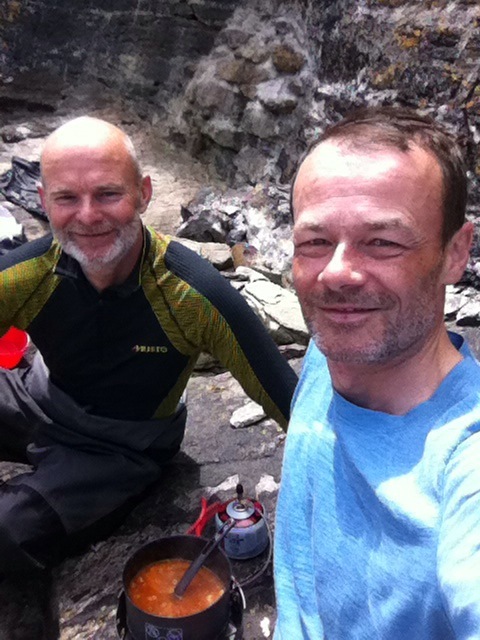 We got up around 6am having slept reasonably well in our bivy bags. By the time I arrived back from a trip to the public toilets, Geoff had already been given a cuppa by our lovely neighbours, and very soon I had one too. We were packed up, said our goodbyes and launched by 8.15. Leaving the Saltee Islands behind us we set off on the 15 mile crossing to Hook’s Head. Using our compasses we headed almost due west (with a pinch of South in it). 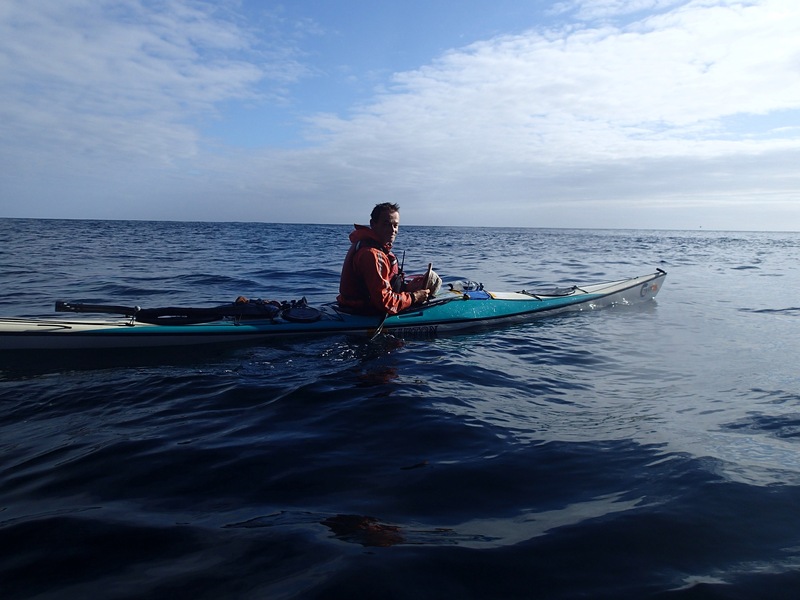 Within a couple of hours we were properly alone on the water with the sun on our backs and making good progress. A good day for wildlife, we saw our first Guillemots,Razor Bills, a solitary Puffin and a sleeping bull seal – vertical in the water. Starting to feel like the expedition has started. 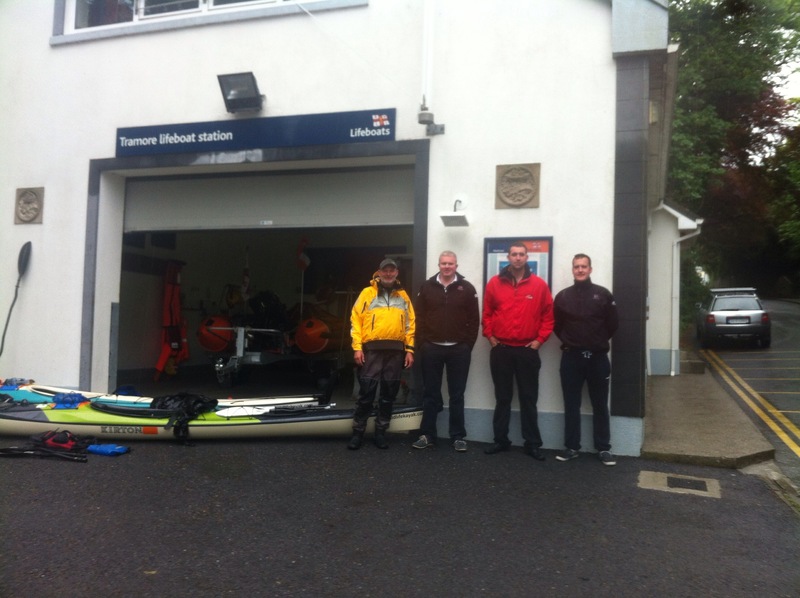 After a stop for lunch in Slade, we pushed on a few miles to Tramore and pulled into small fishing harbour which we discovered was also home to the RNLI. 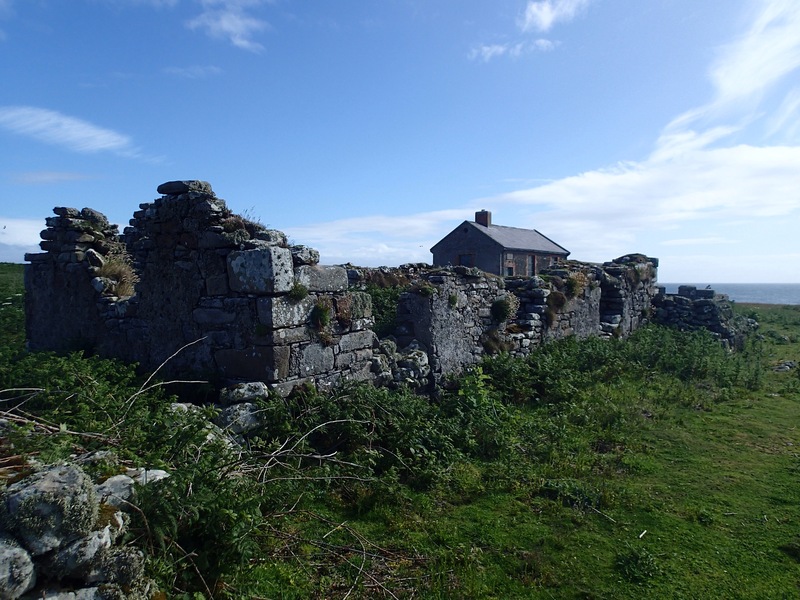 To cut a long story short – what then followed was our second experience of incredible Irish hospitality. 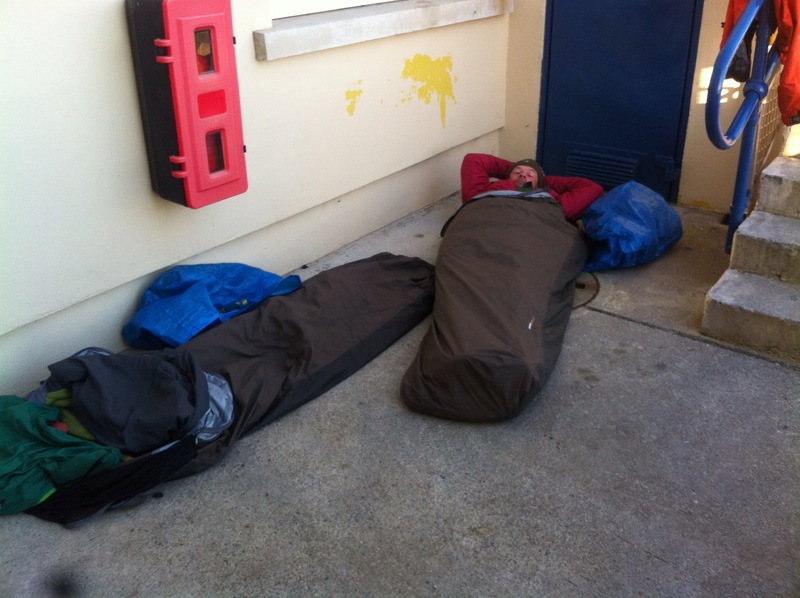 Pretty soon the local RNLI had arranged for us to store the boats and give us a place to sleep. 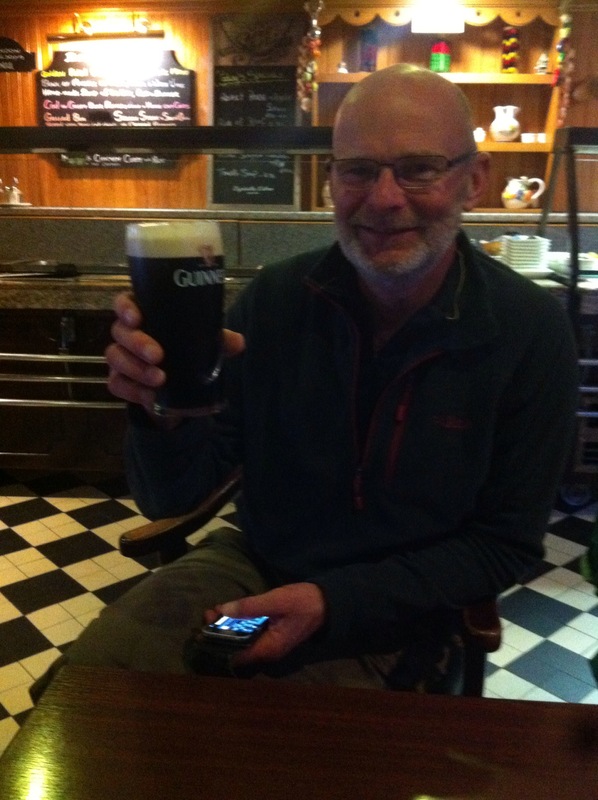 Geoff and I headed off into town in search of food and our first Guinness. 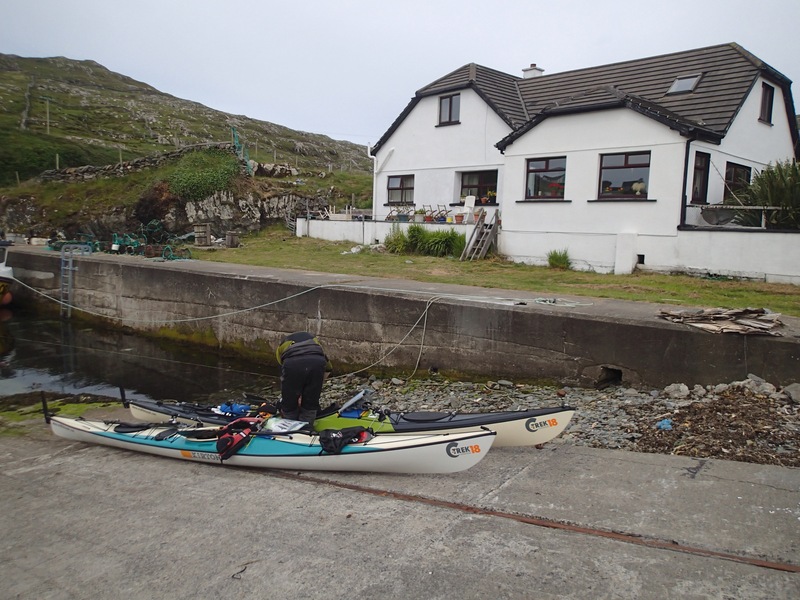 On getting back, a car and a chap on a bike pulled up -Mick O’Meara and Dermot Blount. 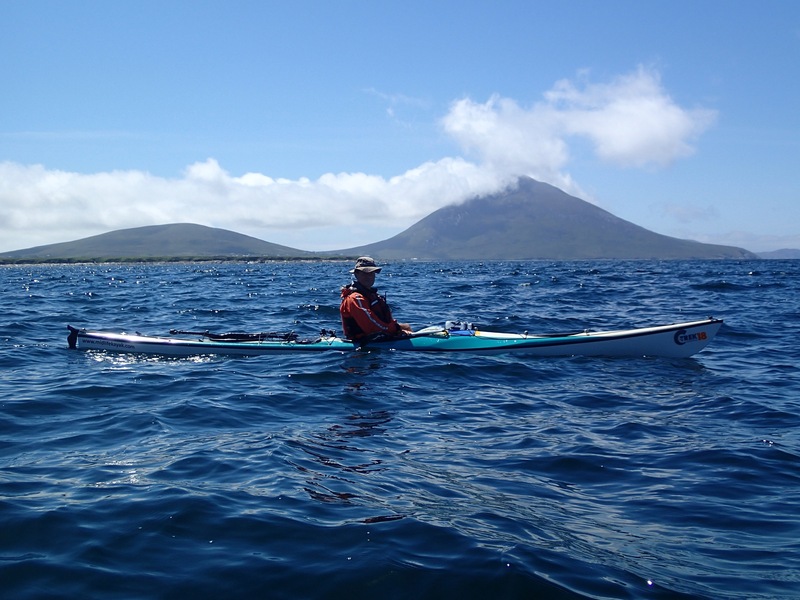 Both of them had paddled round Ireland in 1990 and set the record which stood for over 20 years. We enjoyed hearing some of their stories over a glass of wine and picking up some tips for our trip. Great to meet them both. Thanks both for your hospitality!